Professor emeritus Ernst Katz, 96, died at his home in Ann Arbor on September 2, 2009. George Uhlenbeck had urged Michigan’s hiring of Katz in order to enlarge our department’s work in solid state physics. His doctoral thesis had been on the formation of latent images in photographic film, so at Michigan he and his students worked to find the number of atoms necessary to form a developable speck of latent-image silver and thus provide an experimental foundation for the empirical relationship known as the Reciprocity Law. This led him to experimental work on the Hall effect in sodium chloride and to theoretical work on galvanomagnetic effects on single crystals and to the relationship between energy surfaces and Brillouin zones. He also made useful contributions to our understanding of photosynthesis. 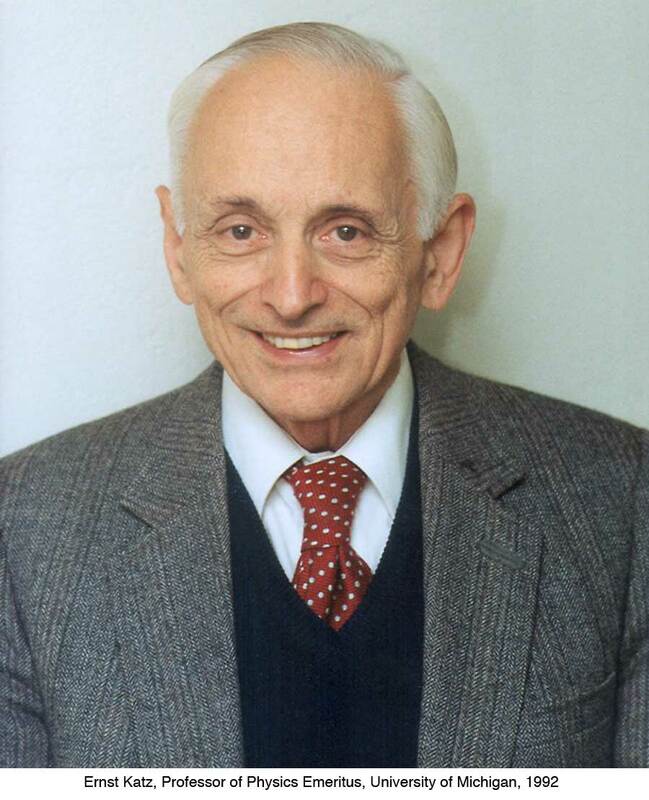 A quiet man with deep respect for academic traditions, Katz was known for his careful, effective approach to teaching in the advanced undergraduate courses in classical mechanics, in electromagnetism, and in solid state physics. His philosophical approach to science, and indeed to life more generally, was a strong influence on the many of his students who first felt his influence in the physics classroom and then followed his lead to a study of anthroposophy. For many years, in particular those after his formal retirement, Katz was a major contributor to the anthroposophical movement; he was a prime mover in the establishment and growth of the Rudolf Steiner School in Ann Arbor. Ernst Katz is survived by his son Johan Katz and daughter-in-law Anush Sarkissian Katz of Oxted, England, grandsons Leon Katz and Daniel Katz, and two great grandsons. He was predeceased by his wife Katherine Katz in 1998. He will be remembered for his contributions to teaching and research at the University of Michigan, and his tireless work for the anthroposophical societies of North America and the Netherlands. 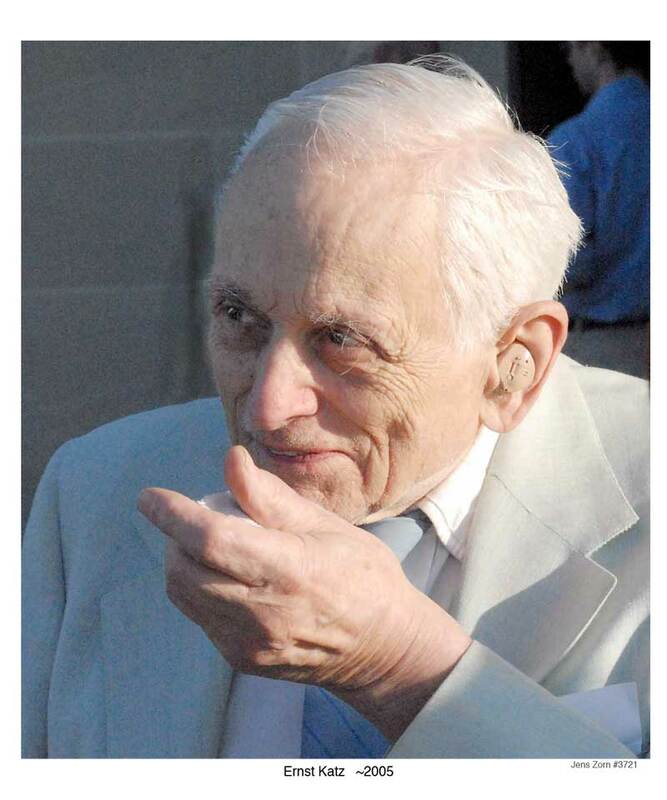 Professor emeritus Ernst Katz, 96, died at his home in Ann Arbor on September 2, 2009. Dr. Katz is survived by his son Johan Katz and daughter-in-law Anush Sarkissian Katz of Oxted, England, grandsons Leon Katz and Daniel Katz, and two great grandsons. He was predeceased by his wife Katherine Katz in 1998. He will be remembered for his contributions to solid-state physics at the University of Michigan, and his tireless work for the anthroposophical societies of North America and the Netherlands. Memorial donations may be made to the Mortgage Reduction Fund of the Rudolf Steiner High School of Ann Arbor, 2230 Pontiac Trail, Ann Arbor, MI 48105. On September 3, 2009 one of the great teachers of anthroposophy crossed the threshold. Ernst Katz was 96 years old. He joined the society when he was 16, and was fully dedicated to anthroposophy as a way of life and for understanding man’s purpose on Earth for all those 80 years. I first became acquainted with Ernst in 1962 when a series of his articles about the book The Philosophy of Spiritual Activity was published in the new journal (now defunct) Free Deeds. I had been reading various works of Rudolf Steiner for about three years. Like many people, I had struggled to understand that particular book, as well as most of Steiner’s other “basic books.” Ernst’s articles were examples of extraordinarily clear thinking. I felt as though I had at last found a competent guide to the lofty ideas presented in The Philosophy of Spiritual Activity. Every time the postman delivered a new issue of Free Deeds I felt a rush of anticipation for Ernst’s next article. About five years later at a summer anthroposophical conference I met a young professor of German from the University of Michigan. Alan Cottrell told me about the Ann Arbor study group in anthroposophy led by physics professor Ernst Katz, and the wise guidance he provided. As a person who had studied anthroposophy mostly alone and had many unanswered questions, I was envious of those fortunate people who had such a teacher. Destiny responded kindly to my envy, for within a year I was offered a position at Michigan State University, just a fifty minute drive from Ann Arbor. I quickly broke my vow never live in a place where it snowed all winter, and we left sunny Austin, Texas for snowy East Lansing, Michigan. The Ann Arbor study group held its meetings in the homes of several members. The presentation protocol was simple. A designated person would present a short recap of a preselected Steiner lecture which was followed by a general discussion. Attendance was typically 25 to 30 eager anthroposophists, and discussion was lively. I found Ernst’s behavior interesting. There was no doubt that he was the leader but he showed no inclination to display his superior anthroposophical knowledge. Often he made little or no comment about a question or topic. More typically the discussion would continue until a question arose that no one could explain adequately. The room would grow quiet as all eyes turned toward Ernst. He would then say rather quietly, “Yes, well…” and then give his thoughts on the question. We learned to have our notebooks and pencils ready at those moments. Physics students at the university also recognized his extraordinary teaching skills and personal character. Once a group of students called on him during office hours and said something to this effect: “You know, Dr. Katz, we students gossip about our teachers, and we have noticed something different about you. Your courses are more alive and you seem genuinely interested that we understand what you present in lectures. Can you tell us what it is that makes you different?” The students were quite correct in their perception, for Ernst believed that every human connection was an event of destiny, and he treated each one with respect and reverence. Some years later, Ernst phoned the regular members of the study group and suggested that we buy an old abandoned fraternity house. The purpose was to create a dwelling for university students interested in spiritual development so they could have a common place to live and study. We responded, and the Rudolf Steiner Institute of the Great Lakes Area was formed as a non-profit corporation. The structure of the building was sound, but the interior had to be completely renovated. Much of the restoration work was done by local members who donated their weekends for at least a year. A central building was created where anthroposophical activities of all sorts could take place. Ernst and his wife Katherine soon sold their large home on the Huron river and bought a small house adjacent to the building now named Rudolf Steiner House. For many years they were overseers of the building and friends of the students and artists who lived there. After it’s mission had been served, the building was donated to the Anthroposophical Society in America and is now the society’s headquarters. The University of Michigan allowed professors to teach what was called “Free Offerings,” full credit courses in their special interests. Course content was carefully screened by a special committee. Ernst applied to teach anthroposophical courses, and after intense scrutiny, was allowed to do so. As a result, he was one of the few university professors at that time—perhaps the only one in North America—who taught courses in both natural science and “spiritual” science. One of the great blessings of a university teaching career is that opportunities for work are always greater than the time available to do them all. Boredom is never a problem. I saw that Ernst accomplished an amazing amount of work, yet never seemed rushed or anxious. How did he do it? I simply could not accomplish everything I wanted to, and decided to make a special trip to Ann Arbor to ask Ernst’s advice for improvement. Of course I hoped that he would give me a few clues as to how one accomplishes more work in less time. Instead, he told me how one of his colleagues, a famous scientist who received many requests for more information about articles he published, responded to all these inquiries—more than he could possibly answer. Ernst said, “He ignores the first and second request by any individual and only answers if there is a third. He figures that if a person asks the third time, he or she is really interested and will make good use of his reply.” That was Ernst’s quiet answer to my question. As I drove home to East Lansing I felt that he had not answered my question at all. I had expected a detailed answer describing how one goes about improving his output. After a time, the answer dawned upon me. Ernst had said in effect, “Here is how one man does it. You will have to develop the capacity and skills to accomplish what you want in your life—there is no simple formula.” Thanks, Ernst. All of Ernst’s teachings, whether given to an individual, or published as essays for all to read, have this quality—they did not provide a ready answer to a particular problem, but required the person to think through the details and find his or her own solution. Ernst knew that we learn most profoundly through our own active thinking, and he was a master at stimulating such thinking. No wonder that his physics students perceived something different about him. All his published anthroposophical essays will soon be available in a book titled Core Anthroposophy: The Teaching Essays of Ernst Katz to be published by Steiner Books. Jannebeth Röell, James Lee, and I edited the book and found the work absolutely inspiring. Ernst’s composition is exquisite. One of the last questions I asked him before his death was, “How do you write these excellent essays?” This was not just a question of curiosity—I wanted to improve my own writing. I was hoping again for an answer in the form of step-by-step instruction. His response was to mail me a copy of a letter by Sergei Prokofieff praising Ernst for one of his essays. Prokofieff is one of the current generation’s most respected anthroposophical writers. Ernst’s letter thanked me for my compliments about his writing and enclosed a copy of the Prokofieff letter. That was all. What was he suggesting? Ernst was too modest to be calling attention to himself, so I knew the Prokofieff letter was not for that purpose. His response said in effect, “You discovered something about my writing that a writer we both highly respect also discovered.” I took that to be a very nice personal compliment, but the real lesson was, “If you will continue to study the essays carefully you will discover the method of my writing.” Then, of course, what I learn will come as my own effort in imaginative cognition, not by following a set of instructions that would likely produce a dull imitation. At that moment I felt deep thanks—thanks from the heart—for Ernst’s answer to my question. Ernst intended all of his writings to be for both the present and coming generations. He would be pleased if you were to select him as one of your spiritual teachers. You won’t be disappointed if you do. Donald Melcer, PhD, is professor emeritus at Michigan State University, a clinical psychologist, and a marriage and family therapist. He coordinates the Anthroposophical Foundation studies at the Austin, Texas, Waldorf School.